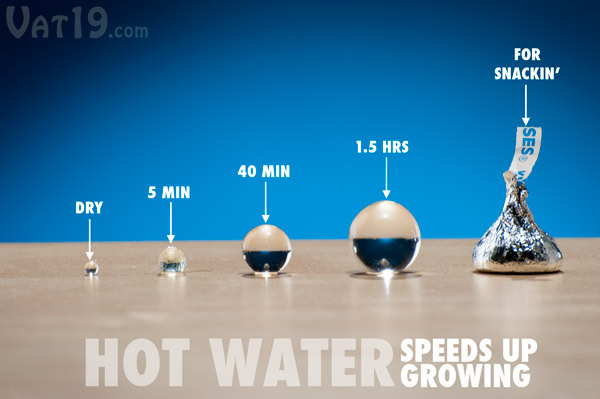 Spitballs: Amazing water-based spheres grow up to 200 times their size. Spitballs begin their lives as small (and somewhat unremarkable) transparent granules. But, add a little water and they'll grow up to 200 times their original size! 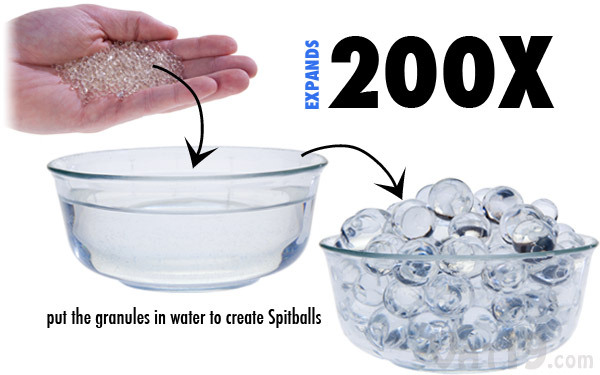 Add the Spitball granule to water and it'll expand to 200 times its original size! 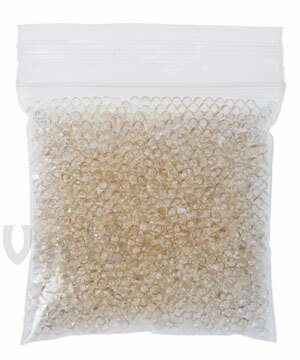 The longer the Spitball granule sits in water, the bigger it will become. Use warm water to speed up the absorption process. In fact, a Spitball can be usable (fireable at a friend or enemy) within 5 minutes when grown in hot water. In under two hours, it'll be large enough to cause a wonderful explosion on the wall, ground, or your best friend's forehead. Use hot water to quicken the growth of your Spitballs. Spitballs are primarily projectiles. Therefore, they are meant to be tossed at just about anything -- a wall, the floor, your Ben Roethlisberger poster, etc. The bigger the Spitball, the bigger the explosion. Spitballs create a fun explosion when tossed at the floor, the wall, or an acquaintance's gold tooth. 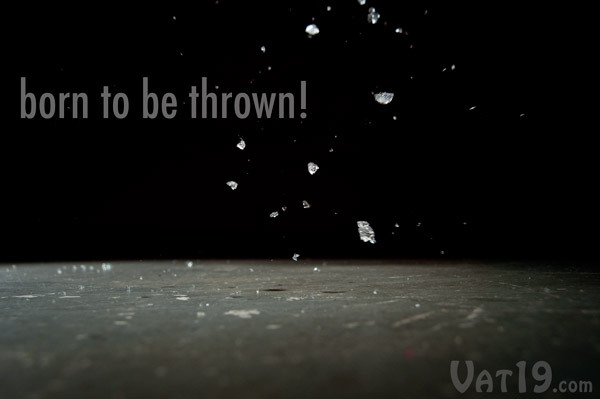 If dropped or thrown lightly, Spitballs will bounce. Spitballs are squishy, slippery, and quite bouncy. If some weak-kneed school "official" has taught you that throwing things at people is "mean", remind them how much money Peyton Manning makes. Then throw a Spitball at the back of their head...and cackle! 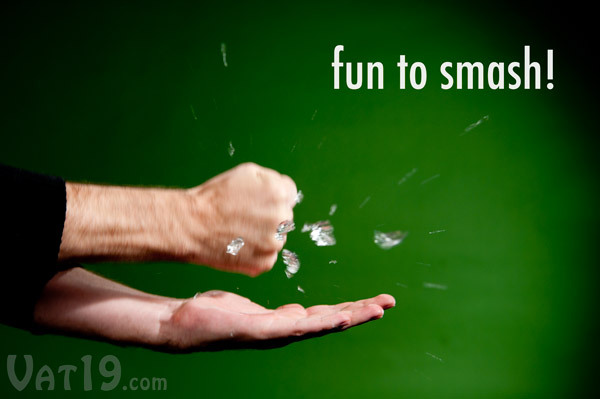 If cackling is frowned upon, show those ninnies how much fun it is to smash a Spitball in your hand. Spitballs are fun to smash. Period. 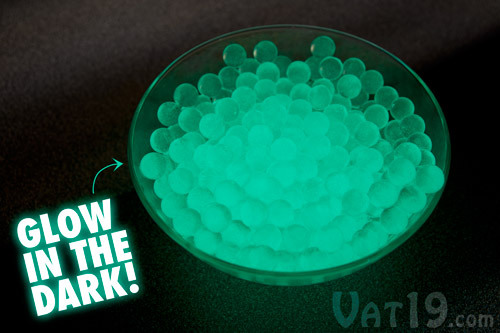 Spitballs are available in three styles: regular (aka clear and nearly invisible in water), water marbles (colorful with a marbled appearance), and glow-in-the-dark. All three styles are roughly the same size with their only difference being appearance. 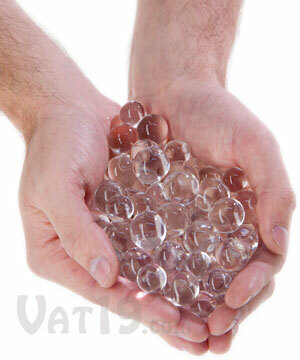 Please note: Water Marbles come in packages of approximately 3,000 Spitballs. 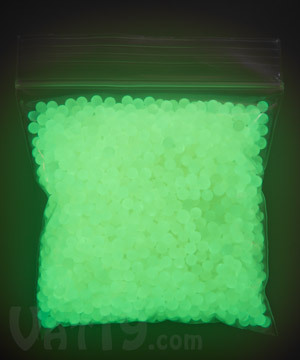 The regular and glow-in-the-dark varieties come in packages of 1,250. 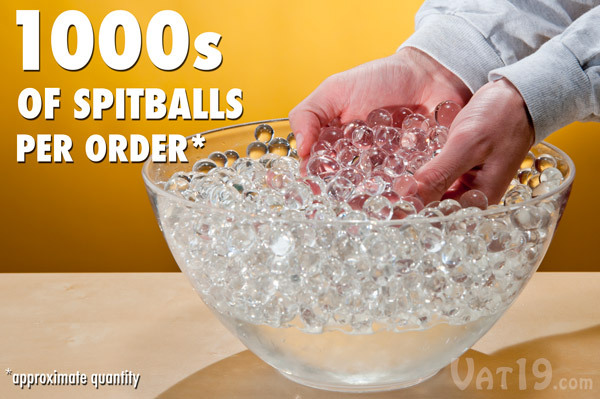 Choose from three styles of Spitballs: Regular, Water Marbles, and Glow in the Dark. Each package includes thousands of spitballs! Spitballs come in packages of either 1,250 or 3,000 spitballs depending on the style you select. 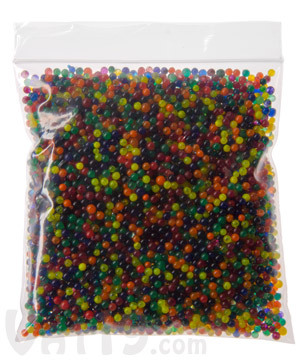 Each package of spitballs includes over 1,000 spitballs. We answer your Burning Questions about Spitballs! Question: So, what's the point of a Spitball? 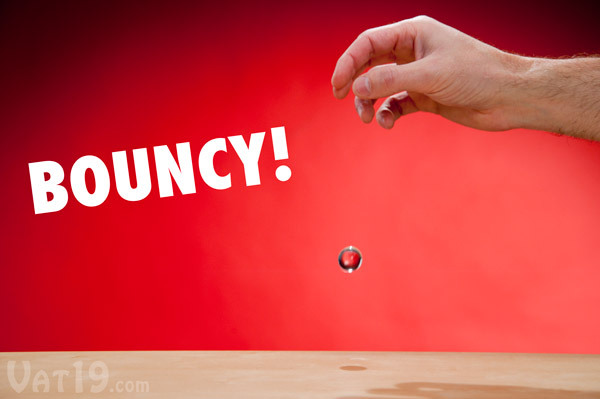 Answer: To bounce, throw, and smash! Answer: Yes! They're 100% non-toxic and completely safe. Question: How long will they last? Answer: If kept hydrated, Spitballs will last indefinitely. If left to dry, a Spitball will eventually return to its original state and can be reused. Answer: If you're a princess, probably. Otherwise, you'll be fine. It's like being hit with an old-fashioned wet (paper-based) spitball. Question: Can you fire them from a pen? Answer: Smaller spitballs can be fired via a pen. 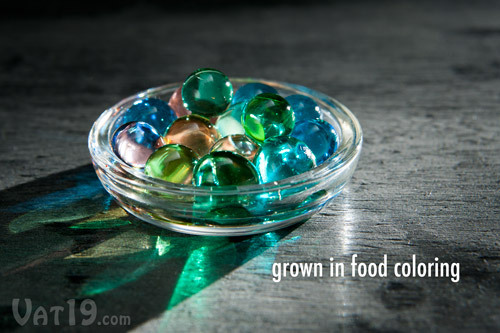 Larger ones can simply be tossed with your hands. If you require more precision, use a 1/2" diameter piece of PVC as your "blowgun". Question: How do you clean them up? Answer: You can simply pick them up with your hand. Smashed fragments can be vacuumed. However, they're essentially water, so they won't cause much harm as they'll eventually evaporate. Question: So I'm just supposed to throw Spitballs at people? Isn't that mean? Answer: If you think they shouldn't keep score at Little League games because it could hurt someone's feelings, then we suppose the use of Spitballs may be a wee bit "medieval" for your sensibilities. For the remainder of the sane planet, here's the unvarnished truth: Spitballs are intended to be thrown because it's dead fun. Oh, and we keep score because an Olympic medal ceremony where every competitor gets a gold sticker is about as "fair" to the participants as a physics contest between Stephen Hawking and anyone else. Question: What does Stephen Hawking have to do with these Spitball thingies? Answer: Very little. But now that we've somehow associated ourselves with such a brilliant mind, don't you think it's time to purchase? Of course it is. Buy, buy, buy!